Stationary Battery Storage Market size will surpass USD 170 billion by 2030, as reported in the latest study by Global Market Insights, Inc. Favorable regulatory policies pertaining to sustainable energy technologies coupled with upsurge in investments toward large scale storage units with increased power output will drive the stationary battery storage market size. Furthermore, the increasing power outages and lack of effective monitoring systems across the emerging nations will positively influence the product adoption. Ongoing technological advancements toward development of distributed generation sources will boost the industry growth. Japan stationary battery storage market size was valued over USD 1 billion in 2018. Increasing electricity consumption owing to the growing commercial and industrial establishments will positively impact the industry growth. In addition, the ongoing investments toward development of microgrid networks along with the rising concerns toward security of supply will complement the business outlook. 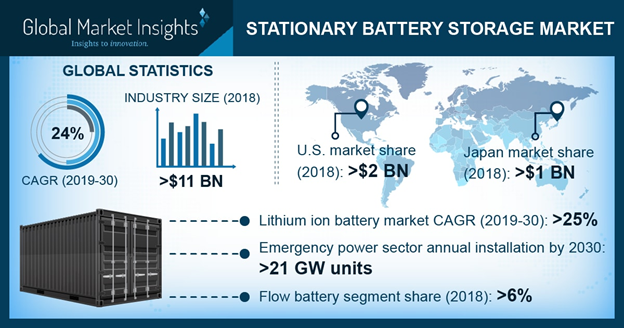 Strengthening economic growth across the developing countries accompanied by a significant expansion in the electrical infrastructure will foster the stationary battery storage market. Shifting focus toward improved power quality along with the increasing reliance on advanced communication networks will encourage the product penetration. Furthermore, increasing investments toward research and development of efficient storage systems with improved service life will positively influence the product demand. Flow battery in 2018, accounted for over 6% of the global stationary battery storage market share. Technological advancement pertaining to the development of cost-effective and efficient storage solutions coupled with the increasing investment toward integration of sustainable grid infrastructure will stimulate the business growth. Higher product efficiency and longer shelf life are the some of the prominent features which will make its adoption preferable when compared with other alternatives. Introduction of sustainable building codes and standards along with refurbishment of the existing electrical network will foster the U.S. market growth. Increasing power consumption along with upsurge in investments toward infrastructure development will boost the industry growth. In addition, the introduction of favorable policies toward development of large scale energy storage projects will further augment the business landscape. For instance, In December 2017, government of New York announced various regulations directing a state-wide energy storage deployment target of 1,500 MW by the year 2025. Increasing demand for energy storage systems along with rapid urbanization and industrialization across the emerging economies will stimulate the lead acid stationary battery storage market growth. Improved life cycle, low maintenance, high working capabilities, low self-discharge and low economic price are some the key features which will enhance to the product adoption. Key participants operating across stationary battery storage market includes Mutlu, Toshiba, Enersys, A123 Systems, Samsung, ACDelco, Tesla, Furukawa, Koninklijke Philips, Hoppecke, Panasonic, GS Yuasa, LG Chem, Duracell, Hitachi, BYD, Exide, Johnson, Durapower, Uniper.